It is that time that you have all been waiting for. Anyone who was reading this blog last year will recall a lot of statements along the lines of “I’m sure we will get some data tomorrow” or “I will get some data soon. Well the time has finally come where I can say that we have collected some DATA! Yay! Placing the 100MHz receiver in a borehole after taking test shots along the ice surface. Optimism is always wearing a sun hat even if there is no sun! We have had on average a 50% success rate so far. The drill is working in the sense that it is heating the water – more than it did last year – however, it will not recharge the 12V battery that is powering the heater, so it only runs for a short time. It has also been leaking hot water onto the ice and has created a rather large, bath sized hole beneath the sledge, which we have since had to relocate! The 250MHz radar managed to collect 80m worth of data in a borehole, which then had to be scrapped because the transmitter lost power before we could bring it back to the surface to quality control the data – grr. The 100MHz radar has managed to collect several bits of data including 2 zero-offset profiles, and some coarsely sampled borehole tomography – until it decided that it didn’t want to play anymore and randomly stopped working part way through a survey. Typing up field notes waiting for the radar to charge. Making the most of the lack of rain. can calculate some rough velocities. Here’s hoping anyway. The seismic kit is currently…missing. We have suffered a little mishap with our shipment being mixed up with…French soap. I am still trying to track this down, but I have every confidence we will locate it. Still, it’s lead to a lot of jokes about using the soap to speed up the glacier ice velocity, taking a bath on the glacier, and using it as a tracer in the nearby Moulin field! 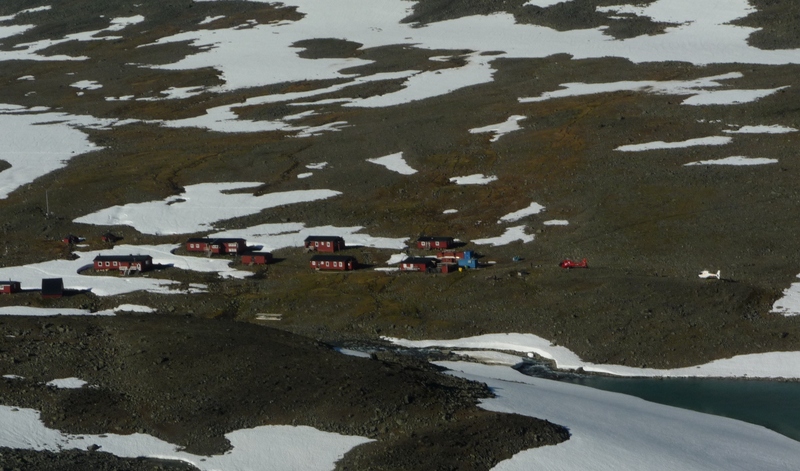 The mini moulin on day 2 – on day 6 this was twice the size and <100m from our field site! Aside from issues with data collection, the glacier is pretty slippery at the moment because it has rained the last two days, smoothing the ice surface, so crampons have been essential. I slipped on the ice yesterday, without my crampons, and now have a nice bruise to show for my troubles! 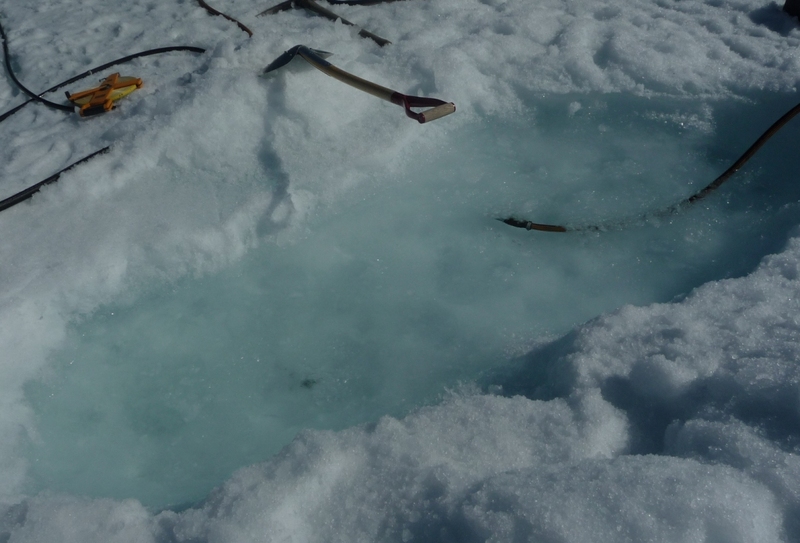 We also have a lot of surface meltwater around us, lots of deep, slushy puddles to test how waterproof our boots are, and a potential Moulin forming by borehole 2. It’s all go here! We have arrived in Tarfala! We arrived in the evening on Tuesday on a helicopter, shared with a group from Minnesota University. We were missing a parcel of inclinometer equipment from Canada, but apart from that I assumed the rest of the kit was in Nikkaluokta after a quick glance. Never assume. We marked the kit drop points prior to the equipment drop. The talented helicopter pilots at KallaxFlyg managed to hit the bullseye with the drill (on the X) and the kit (on the O)! We spent the next morning testing the drill including all it’s components. We managed to get it flowing and heated up(!) and the heater was burning with clean fumes. 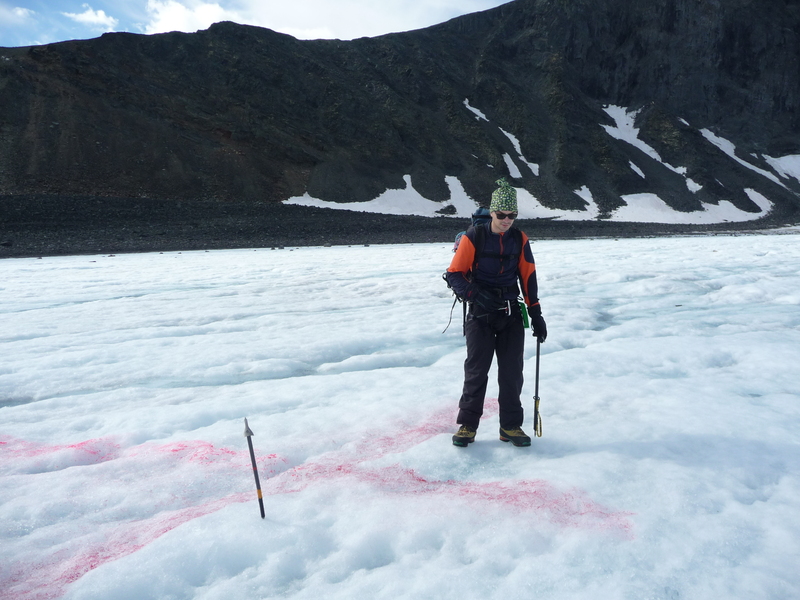 We went up onto the glacier in the afternoon to locate a good spot for the field site and played a small game of naughts and crosses to mark out the drop points for the kit. We then spent the evening packing up the drill and fuel ready for transport. Yesterday we walked up onto the glacier for a supposed equipment drop off time of 10.30. 1 hour later, we were contacted by the helicopter crew to say they would be on the way. So by midday we had (what we thought was) all the kit on the glacier. We met Rafael (Tarfala technician) at the edge of the glacier, in order to carry the drill rig across. The plan was that afternoon to drill the first borehole and set up to complete a VSP the next day. The obligatory drilling photo. Clemens tries his hand at hot water drilling for the first time. The weather is good; the water is warm. It’s a good day. It wasn’t until we were stacking the equipment together that I noticed we were missing a vital component – the hydrophone string. And I later noticed we were also missing a seismic box. SO I spent the afternoon calling the shipping companies and helicopters to track this down while Raf and Clemens drilled the first borehole. We managed to drill 95m in around 2hours – a vast improvement on last year. As a back up plan, we decided to do the radar survey first, instead of the seismic survey, and hope that the kit could be tracked. I am still waiting for an update on that. On the plus side, the inclinometer package was tracked down and delivered, so we can now measure the borehole directions! The drill site in action. More updates to come! Hopefully we’ll be able to improve on our 50% success rate so far. Your equipment is irreparably broken. These are not words you want to hear 2 weeks before your shipment leaves for the final and most vital fieldwork season for your PhD research. Even though that precise phrase was not used, that was the gist of the email that I received yesterday morning. My heart and stomach felt like they were imitating a routine by the Olympic 2012 gymnasts. It’s ok. I assumed there was a possibility that this might happened. I had crossed my fingers and hoped that this wasn’t going to be the case, but I guess you can’t fix equipment through will power alone. So what to do now? Plan B. The inclinometer (the aforementioned equipment) is a vital piece of equipment measuring the deviation of the borehole from vertical. Without it, any other borehole data I collect will be pointless. It is not so much a case of if I should hire one, but where to hire it from and is it within budget. With specialist equipment such as this, there are not many places you can get the kit from. In this case, there is only one company, based in the Yukon. We are still in the process of finalising the hire, but it looks like we may have a feasible Plan B that is, more importantly, within budget. Phew! More updates to come soon. Shipment leaves on 11th July, so not long to go now! The seismic station set up at the end of our line. The geodes (yellow boxes) are both next to it as we are packing the kit away. Now as I haven’t done any field Geophysics since last year, I decided that the best thing to do prior to going to the field, would be to complete a practice survey. This is especially important for seismic surveys, where set-up is extremely important, AND time consuming. It also gave me and Clemens a chance to see how we worked together – pretty well as it turns out! We took the Swansea seismic kit out of storage and set up outside the back of the building. We won’t be using that kit in the summer, but it needed testing anyway! With 30m of space to play around it, it was not quite the same scale as a glacier. 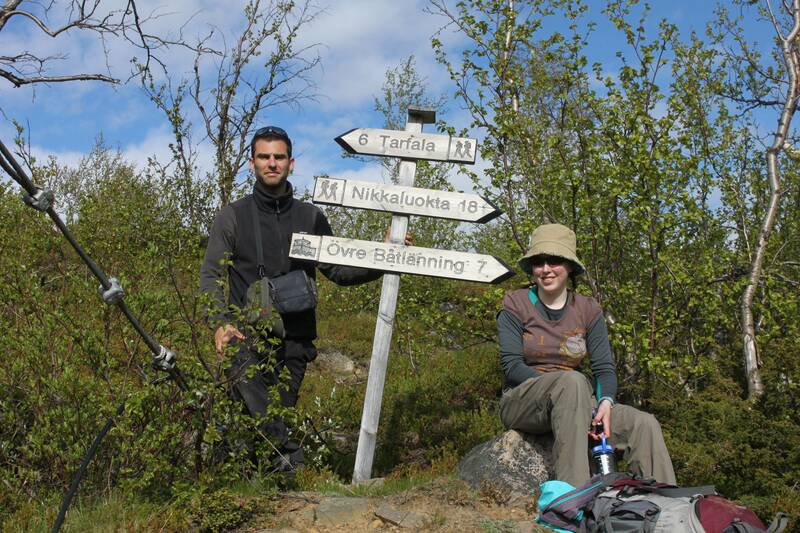 And with 20˚C (or so Clemens insists) temperatures and brilliant sunshine, it was hardly difficult Arctic conditions. But it is always better to test your survey skills in good conditions, before you start trying it in difficult conditions. Mood plays a big part in how well a survey goes. We put the geode batteries on charge, and started by planting the geophones (receivers) 50cm apart from each other, starting at 4m along the 30m tape measure, and finishing at 27.5m. We then starting laying out the geophone cable, being careful to untangle it in such a way that it would not find a way to get itself back into knots again – cables have a magic power to do that you see. Once we came to plugging the cables in, we realised two were in the wrong place and one was reverse of what it should have been. First fail. But, we have now learned! 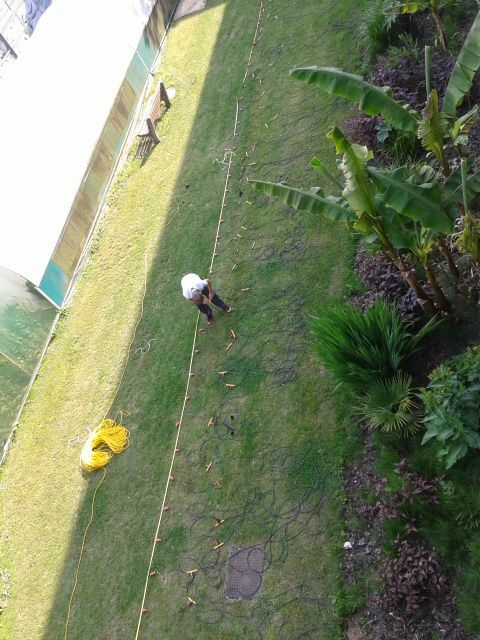 The seismic line, as seen by gawking eyes from the second floor of our building. We then hooked up the cables to the geodes (information-sending boxes) and then turned on the laptop. After turning on seismodule controller – for recording seismic surveys – I realised the data on screen implied that when we made some noise (stamping) that the energy seemed to start halfway down the line and then travel towards us. I had set up the geophones in the wrong place. Second fail. 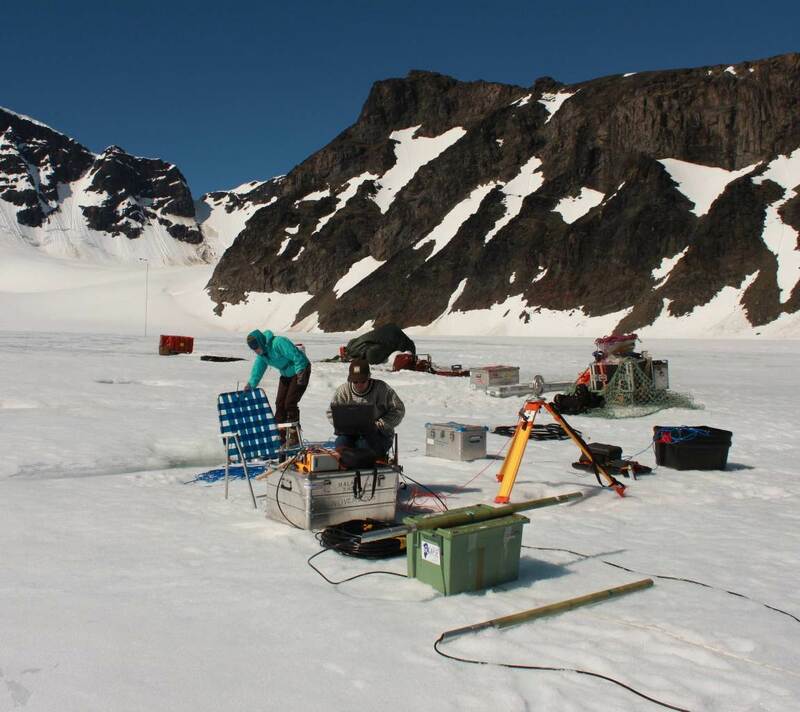 But again, at least we made these mistakes quite literally in our back garden, and not during vital data collection time on the glacier. After moving the geodes to the correct location, we started the survey. We took several shots to practice, with me on the computer and Clemens on the hammer. As much as I hate to admit defeat due to my gender, I know that I simply do not have the upper body strength to continually swing a 6.5 kg sledge hammer. But that’s why I have Clemens! It took us over 2 hours to set up and almost 2 hours to fully pack up. In theory, this should be a bit quicker in the field when we get going, although being on ice it might even take longer, but I think I will have to readjust my field plan to include this set up time! So for those who are interested, here is some technical stuff, for a more in depth description of what I plan to do in the field, and why I am doing this. The overall aim of this project is to measure the changes in the microscale air and water content stored between ice crystals. We can use geophysics to measure these properties as radar and seismic surveys are each sensitive to any changes. Each technique is differently affect by property changes, therefore for the best result, it is necessary to do both. 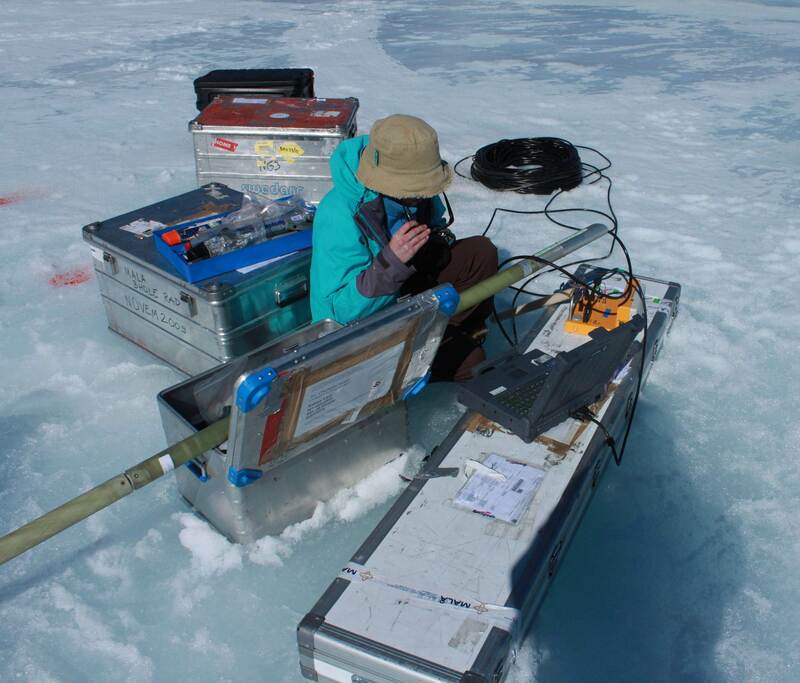 In particular we want to see how the properties vary as we measure deeper into the ice. The surveys we planned to complete were cross-borehole profiles (XHP), using two boreholes, one containing an energy source, and the other a receiver, measuring the energy output. These produce accurate measurements for each depth. However, last year we had many issues when we attempted the seismic XHP. I therefore decided to investigate alternative methods, such as the Vertical Seismic Profile (VSP). This uses 1 borehole containing receivers, and the source set up on the surface. Logistically, this is easier, requiring only 1 borehole, however, the energy must travel further and therefore may not be as accurate. Squinting at the computer screen as I set up the radar. Photo by Yoann Drocourt. I modelled the results I would get, using synthetic data so I could control the inputs. As expected, I found the speed of seismic energy depends a lot on the air content of the ice, whereas the radar energy is affected by both. The XHP model was more accurate for measurements deeper in the ice. However, the VSPs still produced a good result. The ability to obtain data we need, in addition to the improved logistical ease of collecting data in a VSP survey, lead me to decide that this was the best option to ensure data collection this time in the field. A more realistic view of the practicalities of seismic data collection. Hoping for better weather next time! We have since hired a hydrophone string to use in the field. This has 24 receivers separated by 1m, which is non-adjustable. The acoustic energy source will be a hammer blow at the surface. The survey will involve multiple shots at the surface, with at least 12 lines of shot locations – like a clock face. Each shot location needs to be repeated several times so we can average out the noise. All this pre-planning should hopefully lead to better data collection in order to calculate what we want. Improving the calculation of ice properties, like I am attempting to do here, should inevitably lead to the improved production of ice flow model, to see how ice should react to future changes in climate -but that is a LONG way off yet! We have confirmed our fieldwork dates! We will be travelling to Sweden from the UK on 22nd July and returning to the UK on 14th August. We have begun collecting equipment and will soon be packing it up ready to be shipped on the 15th July. It is vital to test that the equipment works before sending it to the field in order to ensure data collection is successful. The hot water drill and radar have both been sent away for repair, and the inclinometer tool is also currently on it’s way to be repaired. The kind folks at Icefield Tools will hopefully get that fixed and back to us before we need to ship it away to Sweden! If I look at last year as a learning experience, I can see all the things that can go wrong – because they probably already did go wrong. Testing equipment before I leave is therefore a top priority to avoid any further issues. Caught in the act: Yoann takes a quick nap while waiting for the drill to work.. In addition to logistical issues, I also have to consider the actual data that I want to collect. Last year, the aim was to collect two sets of cross-borehole surveys, one for seismic, one for radar. This is fairly simple for radar as we own the kit and it easily fits into boreholes. For seismic, we had hired a sparker source and a geophone that clamped to the side of the borehole, borrowed from Queen’s University, Belfast. The issue with this was the sparker had a 10cm diameter, and the clamping arm for the geophone could only extend to fill a 15cm borehole. The borehole diameter could only be controlled by the speed of lowering the hose of the borehole drill. In an ideal world (where the drill worked) this might not have been so bad, we just would not have been able to use the spaker in the same hole as the geophone. However it took us so long to drill the hole for the sparker, the previous hole had closed up. Sigh…hard work! But wait! “It’s hard” is not really a valid scientific reason not to do a survey? Correct. So this year I have spent my time completing forward modelling for seismic surveys to predict the outcomes of Cross Borehole Surveys, and the alternative, a Vertical Seismic Profile (VSP), which requires only 1 borehole, with the receivers in the borehole, and the source on the surface. So, we have hired (from Geomatrix) a hydrophone string (measured the pulse of acoustic waves in water) which has 24 receivers – great, now we don’t have to lower it down 1m to take each measurement!! We can get 80m worth of measurements (at a 50cm spacing) in 8 different depth measurements. It’s so fast! We will also use several shot positions, so that our GPS positions will look like a star with arms out like a clock face. This is called a multi-azimuthal walkaway VSP. We also have a new laptop to use with it as well! Well, it’s not entirely new, since our radar kit communicates to the laptop via a parallel port, we had to get a 5 year old model, but it is an improvement on the old one we have affectionately nicknamed “the brick”. The good news is the melt has come early this year and ice is already exposed on the glacier. With any luck we should have some meltwater to use when we get there in July. Next challenge – finish testing and pack up the kit. Not long to go now until fieldwork take 2! Now I am aware that last year, there was a lot of promises to collect data via this blog, and optimism that the next few days would provide this. However, it seems this was not to be. 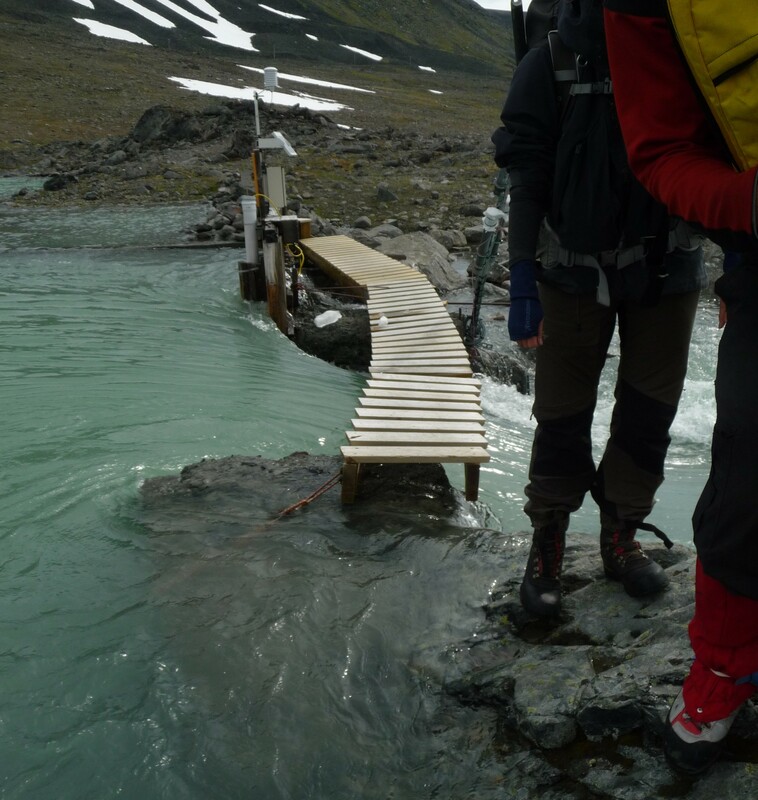 In the last few days, mother nature cut us off from the glacier, flooding the bridge and therefore our only access. Lillsjön lake, by Tarfala Research Station, shown at the end of June, prior to snow melt (left), in early July after snow melt (centre) and flooding the valley after a day of heavy rainfall (right). This flooding prevented us from travelling onto the glacier for 2 days, and delayed our ascent on the third. The weigh of the water, in addition to any ice from upstream, caused the wood supporting the bridge to crack. The excess water flooded the valley so much that we were only JUST able to cross to the other side safely. We contacted the station over the radio about the bridge and it was repaired enough for us to cross back safely at the end of the day. The following day, after waiting until 10am, the waters receded enough for us to cross, although as you can see from the photo the bridge was not exactly stable. We thought that our luck might have changed for this last day. 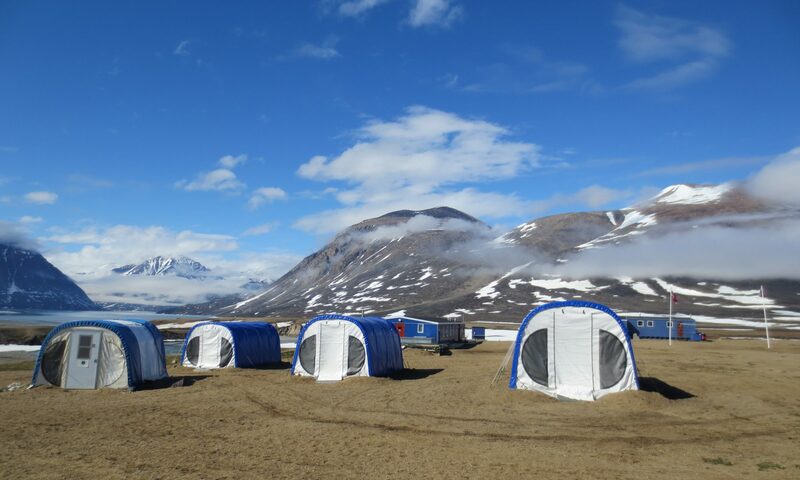 Arriving at the drill site, we realised that the bad weather must have included a strong katabatic wind. 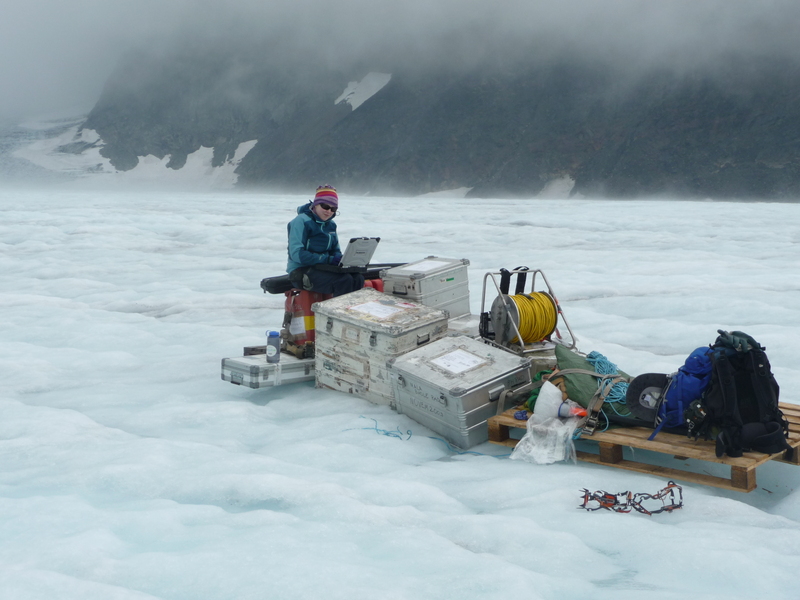 Our generator (35kg) had been rolled onto the side of it’s square frame; two box lids and an entire zarges box had rolled off down the glacier, as had the (mostly empty) antifreeze barrel. Most of the missing items were located again, and with some gentle encouragement, we managed to get an unhappy generator working again. In addition to this, the drill broke completely, one of our boreholes had closed beyond use, and the radar was also not working. All we were left with was the borehole geophone and a sledge hammer, in a >30cm wide, 22m deep borehole. In theory, for the geophone to work, it needs to be able to clamp to the sides of a borehole (max clamping width = 15cm). The hope was that the geophone might also collect data if it pretended to be a hydrophone (http://www.glossary.oilfield.slb.com/en/Terms.aspx?LookIn=term%20name&filter=hydrophone). Unfortunately, despite our best efforts to collect data with everything we had left, we simply did not have enough time. 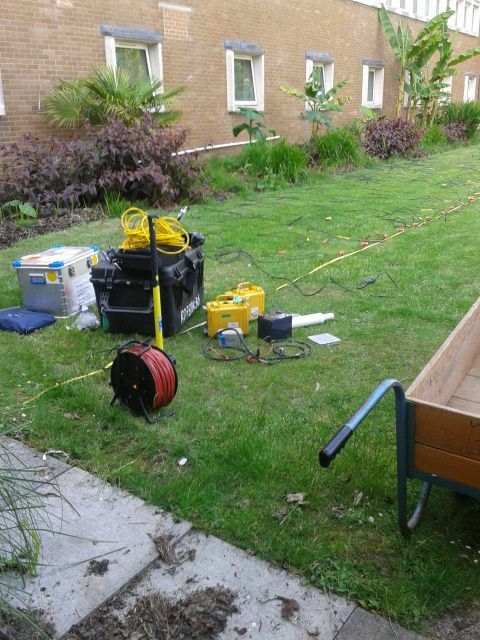 We did manage to collect GPS readings of all boreholes and the seismic line using a Trimble differential GPS. GPS uses satellites to calculate the position of the mobile unit – the more satellites that the GPS can “see”, the more accurate the positioning The accuracy of this particular GPS is further improved, as the mobile unit is calculated not only by satellites, by also relative to a base station. The base station is a second GPS unit set up at a precisely known location – in this case, the roof of a building in Tarfala Research Station. So, last summer did not exactly go to plan. However, I remain ever optimistic that this fieldwork will work. We have experience now, we know what can go wrong, and we know what needs fixing prior to arriving at Tarfala. 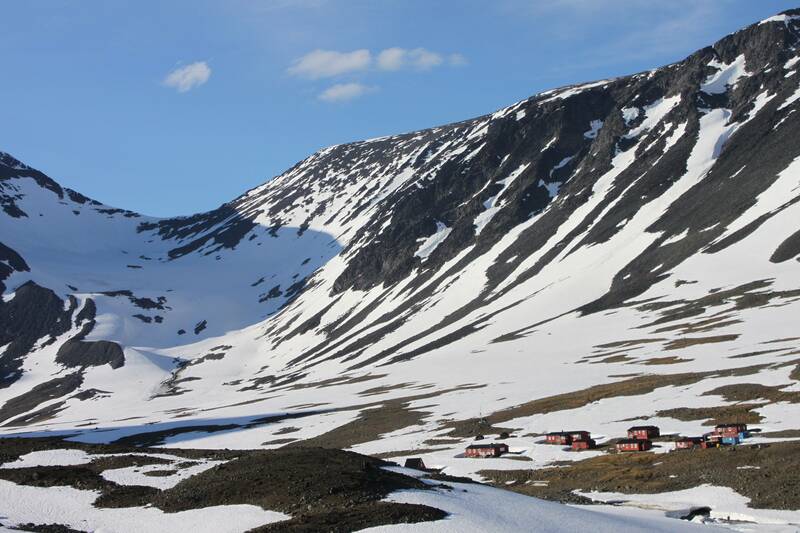 Somewhat more importantly, INTERACT Transnational Access has yet again supplied me with the funding for the PIPS project (Physical Ice Properties of Storglaciären), so that I can travel to, and stay at Tarfala Research Station for the field season! THANK YOU! So rather than just blogging from the field this time, I will also include you in the planning process. The updates so far are that the hot water drill will be travelling to Kiruna by snowmobile this spring for a full service. Unfortunately, Yoann will not be returning to Tarfala this summer; instead I will be travelling with a new field assistant, Clemens Schannwell. 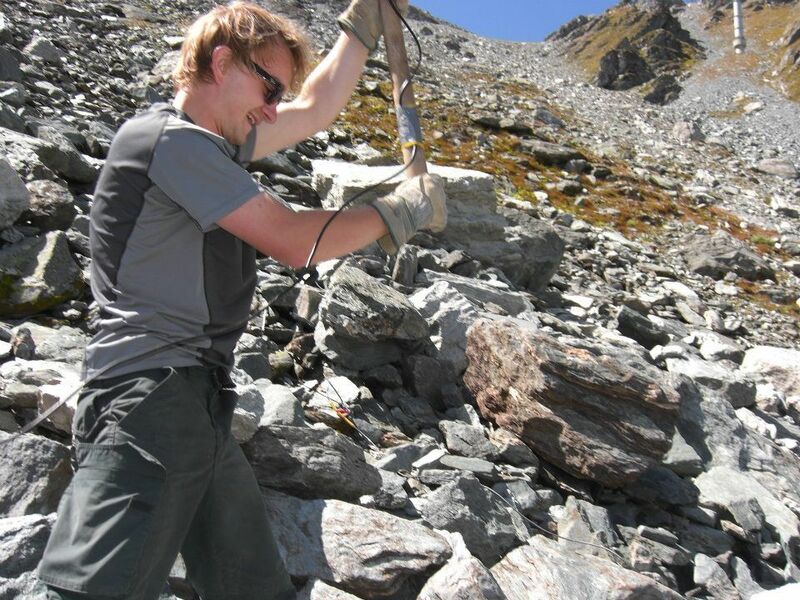 Clemens is an MSc student in the Glaciology Group at Swansea University; he is working with GPR data from Midtre Lovénbreen (Svalbard), analysing the glacier structure. 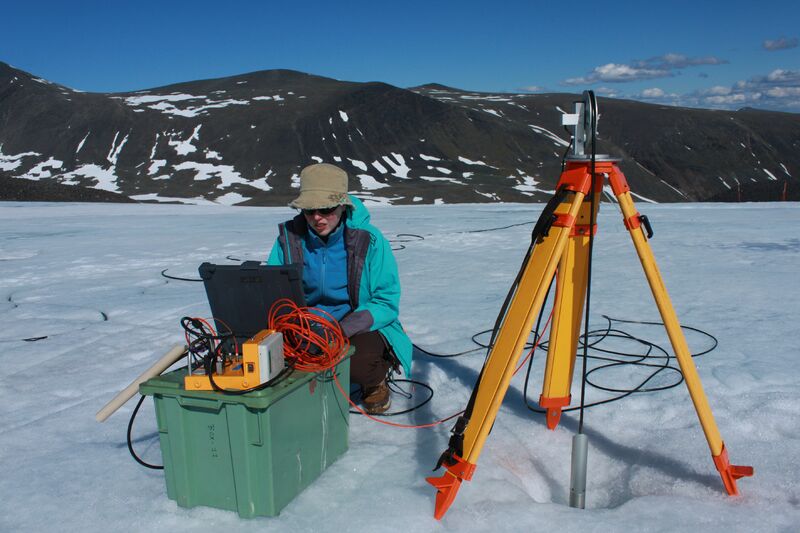 In combination with spending a year studying in Fairbanks, Alaska, Clemens has experience in both geophysical surveying, and working in cold conditions. Field Team #1: Charlotte Axtell. Second year PhD student at Swansea University. The face behind the blog, PI on the PIPS project, and an enduring optimist. Field Team #2: Clemens Schannwell. MSc Student at Swansea University. Fieldwork Enthusiast. We are looking forward to going back to Tarfala this summer and are hoping for better luck this season. In addition, we are doing everything we can to ensure the equipment is functioning correctly before we arrive at the station! Any useful suggestions to help make this field season as effective as possible are very welcome. Bring it on Storglaciären, we’ll be back soon! Setting up the radar reflection survey. It’s a cold day, but very bright making it difficult to see the computer screen! Well, the good news is that our radar kit has arrived! We managed to get the kit out and working and set it up for a reflection survey. As we had taken the inclinometer survey in the borehole we figured it was about time we had some data to go with it! As background information, for those who don’t know, a reflection survey uses two antennas: one that transmits energy, and one that receives and measures its strength. For radar, this energy is electromagnetic, like light. In this case, the antennae are fixed at a set distance apart and placed into a borehole. We have a borehole wheel which communicates with the computer so we know how far down the borehole we have lowered the antenna. The energy is sent out and reflected off surfaces between two materials with strongly contrasting electrical properties, for example ice and water. This information is recorded on the computer to be recorded later. In this case, energy will reflect strongly from the borehole walls, crevasses (especially those containing water) and even microscopic pockets of water contained between ice crystals. Tavi shows us the ropes of a GPR zero-offset profile. The profile is very short as the borehole is now unusable below 3m! Now for a bit about my science. My project is focused on measuring the amount of water stored at the microscopic level, found in ice that has been warmed almost to melting point, either through direct heating or through compression. Although we cannot resolve the individual pockets of water (and air) stored in the ice with these types of survey, their presence will still have a clear effect on the geophysical data. To do this, I will be using two types of geophysical equipment, seismics and ground-penetrating radar (GPR) using acoustic and electromagnetic waves respectively. The survey type that I hope to do involves drilling two adjacent boreholes, putting the transmitter in one borehole and the receiver in the other. Starting at the surface, these will be lowered by equal amounts; the energy should travel in a straight, horizontal line between the two boreholes, measuring the properties of the volume of ice in between them. This is known as a zero-offset profile (ZOP). While attempting to drill a second hole downstream from the first borehole (BH1), I completed the radar reflection survey in the borehole, along with supporting inclinometer and borehole camera surveys. 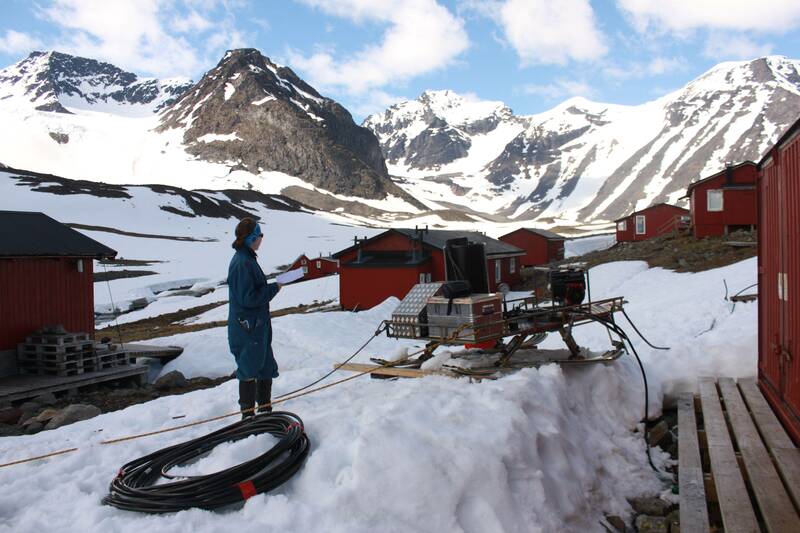 We cannot perform a seismic survey while drilling as this creates a huge amount of background noise with the generator, pump and diesel heater rattling around on the glacier surface. 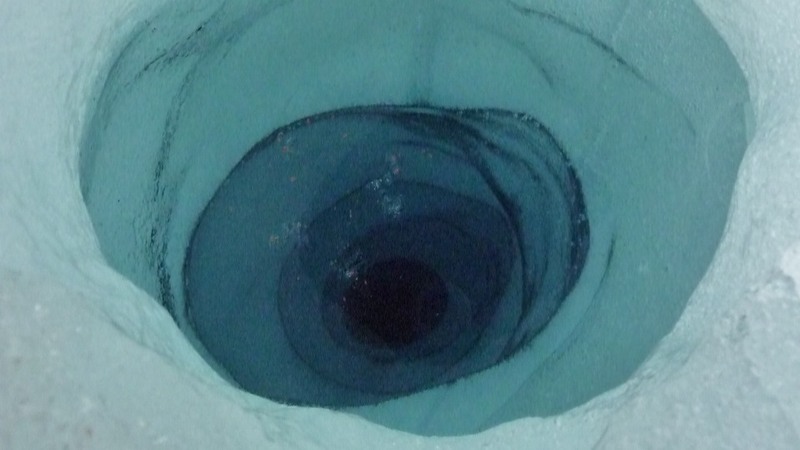 The drill was again being particularly awkward and very inefficient, and after drilling a mere 15m into the ice for the second hole, it stop working. So began the days of frustration in trying to figure out what was wrong. With the drill being off, we took the opportunity to complete some practice surveys with the boreholes we had drilled; this enabled us to check that the equipment was working. The only equipment we could not test was the seismic borehole source, as this required a wider and water-filled borehole. To test this, we tried a vertical seismic profile (VSP) and a radar zero-offset profile (ZOP). The geophone (seismic microphone) used for the VSP is a 3-component (measures vertically and in 2 horizontal directions) borehole geophone that clamps to the sides of the borehole (kindly lent to us by Queen’s University, Belfast). The geophone is only ~5cm wide, however as we had drilled BH1 a few days ago, we found that the geophone would not go past 3m depth in the borehole. This was also the case for BH2, producing two very short practice surveys! But we have at least had experience now. The new drill tip created by Erich and Bernard Heucke and painted by Yoann. Now better known as “The Bumblebee”. Used as a “hat” over the top of the current drill stem. Now, back to the drill. Up until a few days ago, we had found countless issues with the drill, that I shall not bore you with now. I shall simple state that with the timely arrival of a new car battery (via helicopter) and the expert and frankly invaluable assistance from Erich and Bernard Heucke, who conveniently happened to be in Tarfala precisely when needed(! ), we are now able to use a working hot water drill! They have even pieced together a new drill bit for us to attach to our existing drill stem. This will hopefully produce a hole that is both straight, and wide enough for the seismic source to be used. It takes lots of time and patience to create a hole this large. We have started drilling further towards the centre of the glacier now in an attempt to produce a non-draining borehole. One borehole has been completed to a depth of 67m, even with the occasional issues with water supply and drill failure. The full depth we wanted to reach was rejected as we are running short on time. The second, larger borehole has been drilled to 22m so far, although the drilling speed is far slower in order to obtain the required width. Luckily the sun and rain over the last few days have created a great deal of stored water for us to use, so the lack of water is no longer an issue. And I’m sure Yoann is quite grateful not to have to dig anymore water pits! Looking back in the previous blog you can see the full extent of the snowmelt at Tarfala in just one week! At some point soon we hope to put the seismic and radar instruments down the borehole. Lets hope that the new drill bit works so we can finish the borehole and get some usable data for my PhD! This blog was created a few days ago and due to limited internet connectivity it has not been published until today. You will be able to read an update on our progress on the next installment very soon! Welcome to the second part of my blog! I write this on day #9 of my fieldwork. Don’t fall in, I don’t want to have to pull you back out! 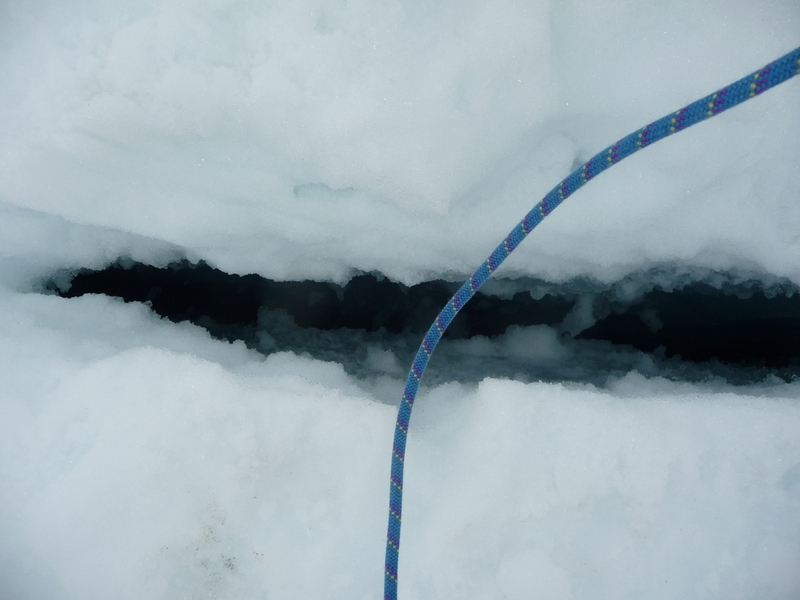 On the last instalment, we had moved all the gear into position to begin drilling, and had noticed what we thought was a sizable crevasse running almost directly under our equipment. Well, we thought it was sizeable, until Yoann managed to locate a larger one with his left leg! It was the first day we had decided not to wear snow shoes, and with the snow level decreasing in the brilliant sunshine, the crevasse was not far below the surface. Bad luck for Yoann, but he managed to climb out safely, and still smiling! As it turned out, the crevasse running through the field site had sealed over-night, and so became a perfect water store. Since there are no meltwater channels currently on the glacier surface, it was necessary to dig a trench to obtain water for the drill. A pit was dug into the crevasse which held a nice amount of water and we drilled a 10m “practice borehole”. The set-up of the system took a while as it required connecting all of the hoses; fortunately this process only needs to be completed once. It was slow going as we got used to how the drill works, which certainly only seems to be when it feels like it! Yoann relaxes on the drilling rig as the clouds creep over Kebnekaise. The next two days produced some terrible weather, with 25m/s northerly winds in the Tarfala valley, and equally fast winds blowing down the glacier from the west. Braving the moraine to transport equipment to the glacier became a nightmare as we were nearly blown over on several occasions. We started early on day #6; lucky as we took 3 times as long to get out onto the glacier than usual. 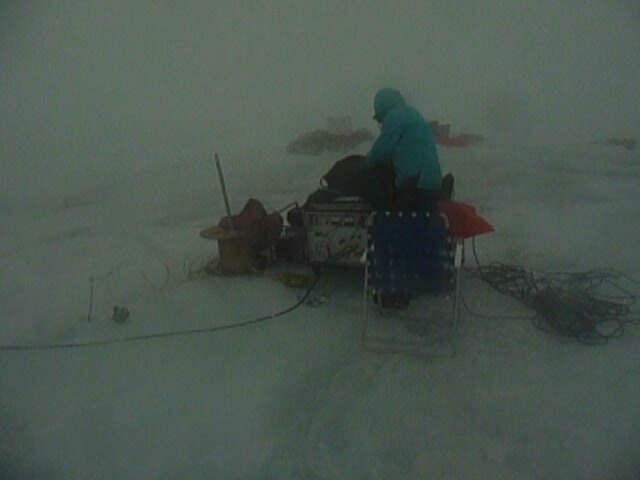 The wind had buried our equipment in snow and our crevasse water pit had drained over-night. Fortunately, the strong winds died down by around 3pm. We dug a new water pit; attempting to enlarge this pit with the hot water drill resulted in drilling into a fracture and draining all our hard work! It’s all a learning experience! We also successfully managed to drill (what we thought was) a borehole to approximately 52m deep. This was a very long day, involving us staying out on the glacier until 10pm. We were tired but relieved we had made some progress. Come take a dip in our shallow plunge pool. Warning, may contain drill hose. Day #7 was calm and sunny and we were relieved to see that our water pits were still present and, more importantly, still contained water! We received a couple of visits during the day by some students from a high school in Stockholm who were experiencing life at an Arctic Research Station as part of their end year projects. They were able to look at and take part in some of the work the scientists in Tarfala were completing, including our hot water drilling exercise. When we completed the borehole, we quickly realised that we must have drilled through a fracture, as the water had clearly drained away. In a way, this is beneficial, as there is no water in the borehole to freeze and close the borehole. However, it also means that we cannot use the seismic source here. We decided to attempt to drill the second hole, hoping the water in this would remain, however within 1.5m this also drained of water. As it was 4pm by this point, we decided that we would call it a day, returning to Tarfala to enjoy a more relaxed and warm evening with a barbeque! Watch you don’t fall in, it’s a long way to the bottom! On day #8 we were joined by the third member of our field team, my PhD supervisor, Tavi Murray. After spending the morning ringing around what felt like most of Sweden, I managed to track down our remaining field equipment coming from Malå, and organised to be flown up to the glacier later in the week (great news). On the glacier we started to drill borehole #2, 1m west of the borehole we had started the previous day; this was an attempt to produce a non-draining borehole. Unfortunately this was unsuccessful. We spent the afternoon attempting to clean the diesel heater to make it more efficient. The heater had other plans and decided that it wanted the afternoon off. We collected an inclinometer survey of the existing borehole (BH1), and found that our “80m” borehole in fact 108m deep. It also demonstrated the issues with continuing drilling a borehole a day later, the first day the borehole was straight, the second, the borehole was diverted downflow by 10m! 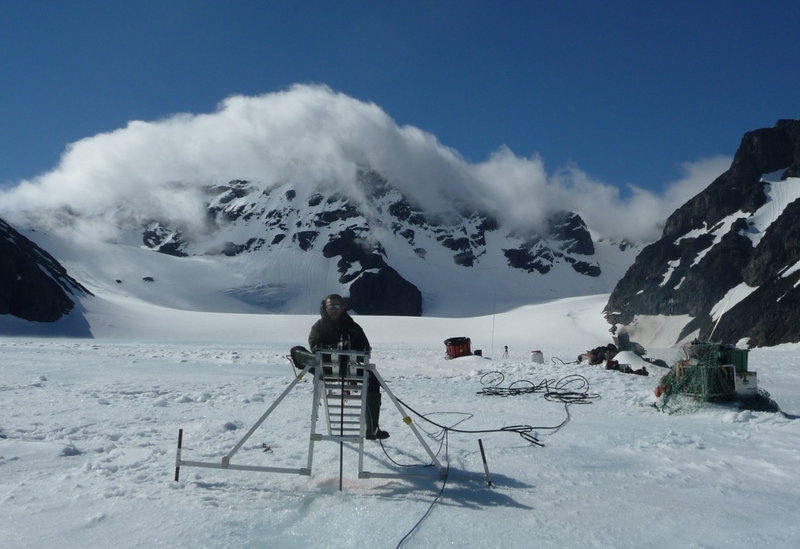 Today, we tried to get up onto the glacier with the addition of a Tarfala field assistant, in order to drill a second borehole, located further towards the centre line of the glacier in an attempt for it not to drain, and to collect the first real data of the field season. Regrettably, the weather today was not on our side. Rain on the exposed ice at the glacier surface, without the addition of crampons, resulted in multiple members of the field team travelling across the glacier in a seated position! Defeated, we returned to the station just in time for a cup of tea! An unsatisfying end to the day with regards to science, but fun sliding down the snow slope back to the station! With much better weather promised for tomorrow, in addition to our remaining kit arriving by helicopter, we hope that we can get some real science done! Hello and welcome to my blog! 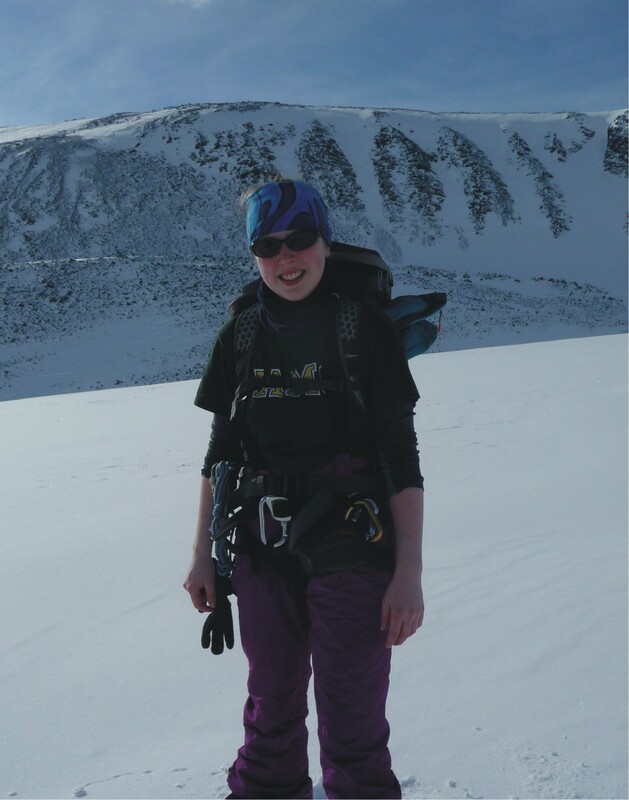 My name is Charlotte and I am an PhD student at Swansea University, UK.Through this, I am hoping to post about the work I am doing on the Swedish glacier, Storglaciären. Myself and my field assistant, Yoann Drocourt (also a PhD student at Swansea University) will be based at Tarfala Research Station for the duration of this field season. Due to limited internet and a couple of very busy days, I begin this blog on our fourth day here in Tarfala. After a very long journey here, beginning at 4am (GMT) on Tuesday 26th June and ending with strenuous 24km walk, we arrived at Tarfala at 7.30pm (GMT +1) on 27th June. The lush green of the Kebnekaise valley was replaced with the snow covered rocks up to Tarfala. It was tough going, but we made it! Exhausted, we were especially grateful to arrive in time for a hot meal and a shower! The next day, there was no time to relax and recover from our travels and it was straight to work! 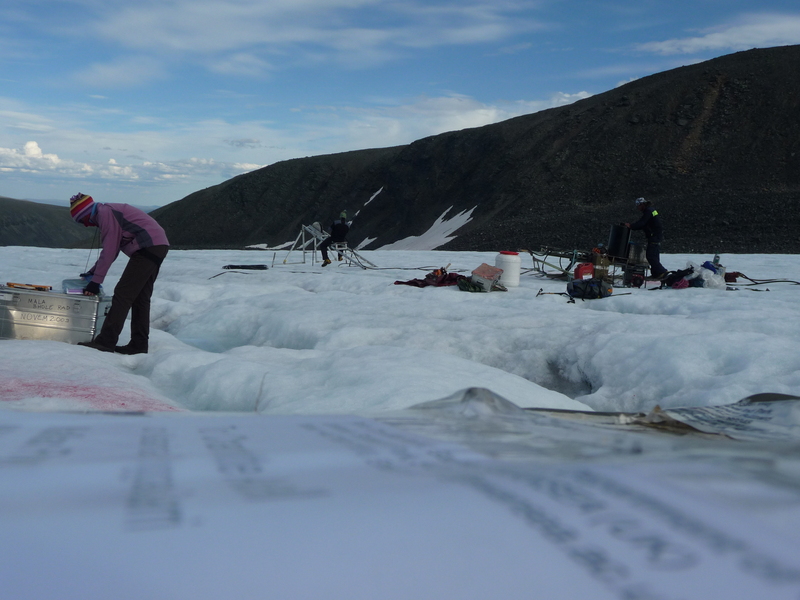 The science we hope to complete up here requires drilling boreholes into the ice using a hot water drill. 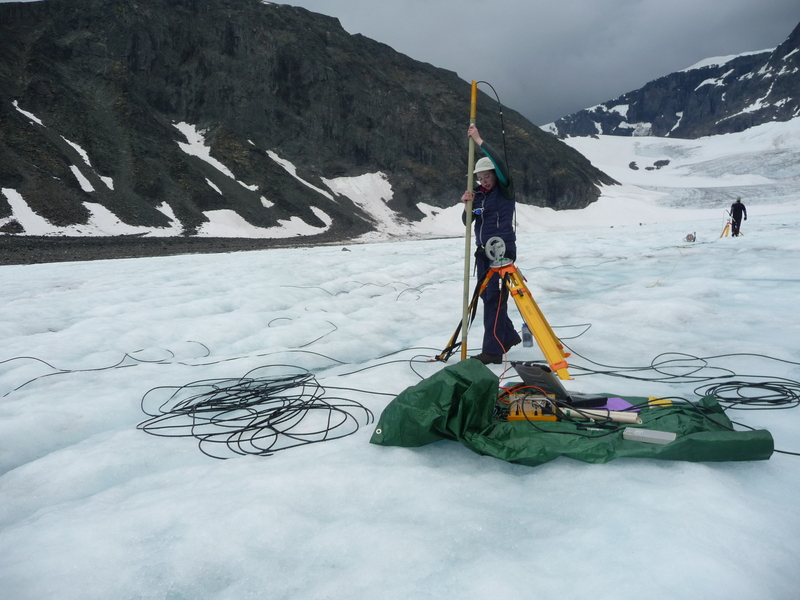 We had to test the connections and make sure that it was all working before it was flown up onto the glacier along with the rest of our equipment. Most of the day was spent connecting up the drill, checking the generators were working, and running water through the system. It was slow work, but we took our time and finally managed to get it running. That evening we took a walk up onto the glacier. It was a tough climb up the moraine, especially as we had not quite recovered from the trek the previous day! 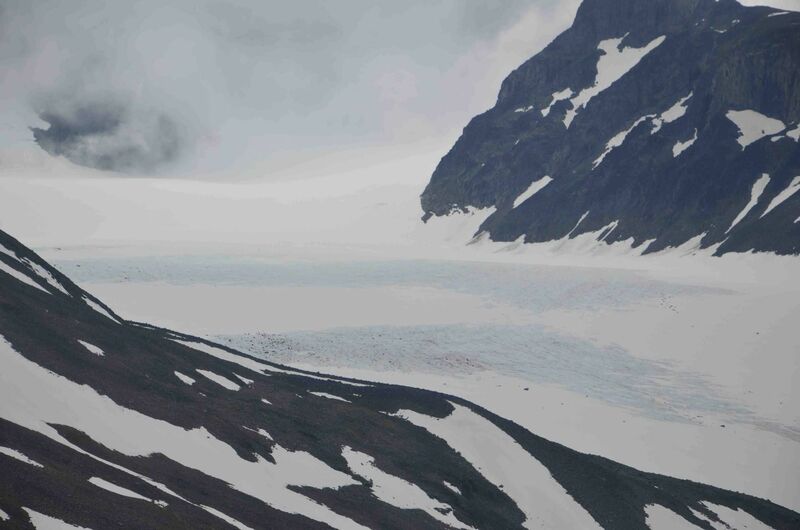 There is still a significant amount of snow on the glacier, although we are told that it has changed a lot since Monday (25/06). 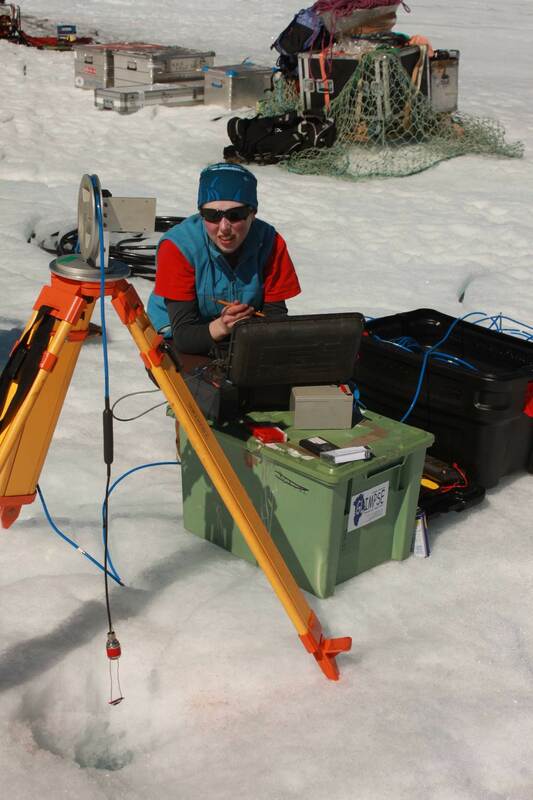 Using a snow probe, we discovered that the snow was on average around 40cm deep at our proposed field site. The area was marked with poles ready for us to return for the helicopter the next day. 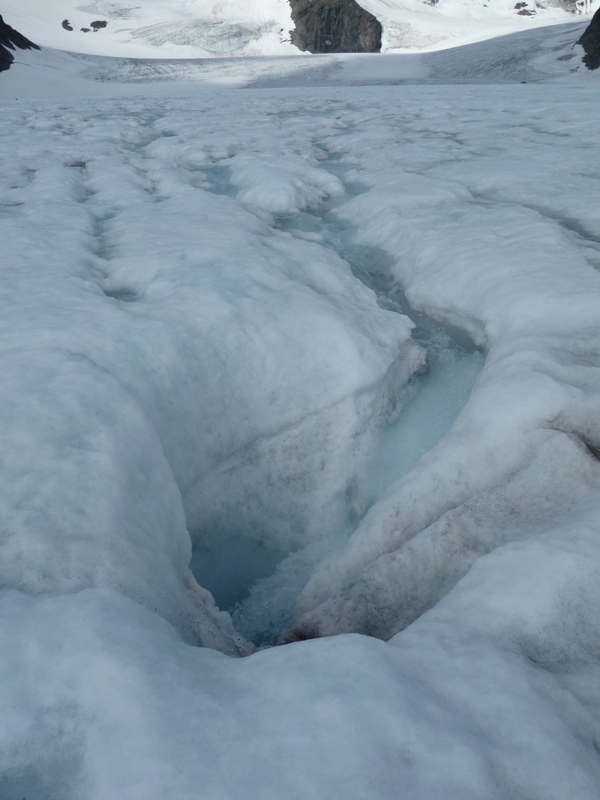 As the snow on the glacier surface begins to melt, crevasses (cracks in the ice) and moulins (holes at the ice surface into which water drains), previously filled with snow, begin to appear. 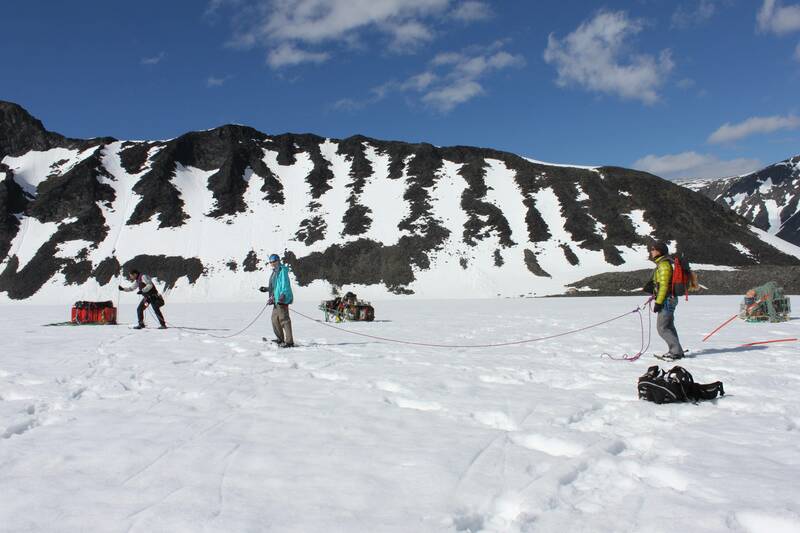 For this reason, when moving about on the glacier for safety we were roped to another person, and had to remain at a safe distance from them, keeping the rope tight. After the helicopter drops off the equipment, Yoann does a quick but dense survey with the snow probe around the equipment to make sure it is not sat over a hole. The rest of the group stand at a safe distance keeping the ropes tight. An area was probed before the helicopter dropped off the equipment to make sure it was safe. This was a very rough survey, and so it was important to check in more detail around the equipment to make sure it wasn’t sat directly above a moulin! 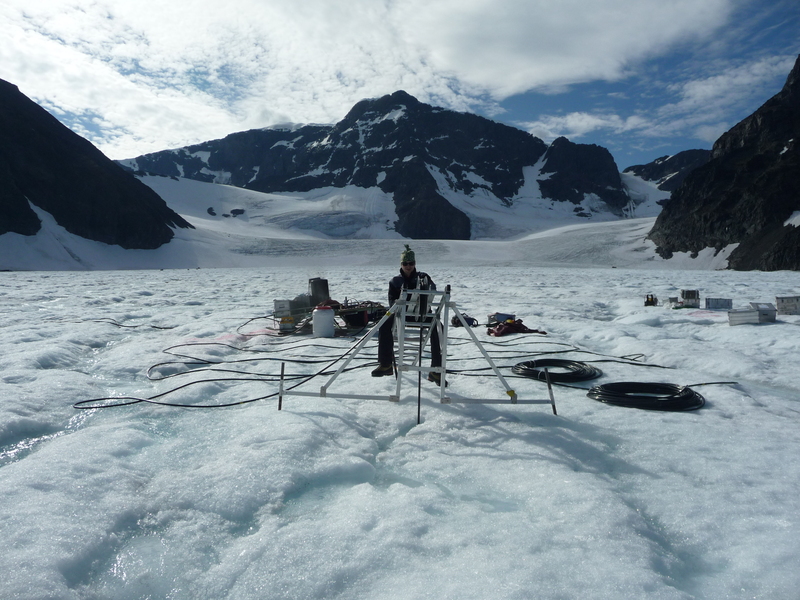 We were grateful for the presence of snow on the glacier surface, as it provides friction and something to anchor the equipment to. 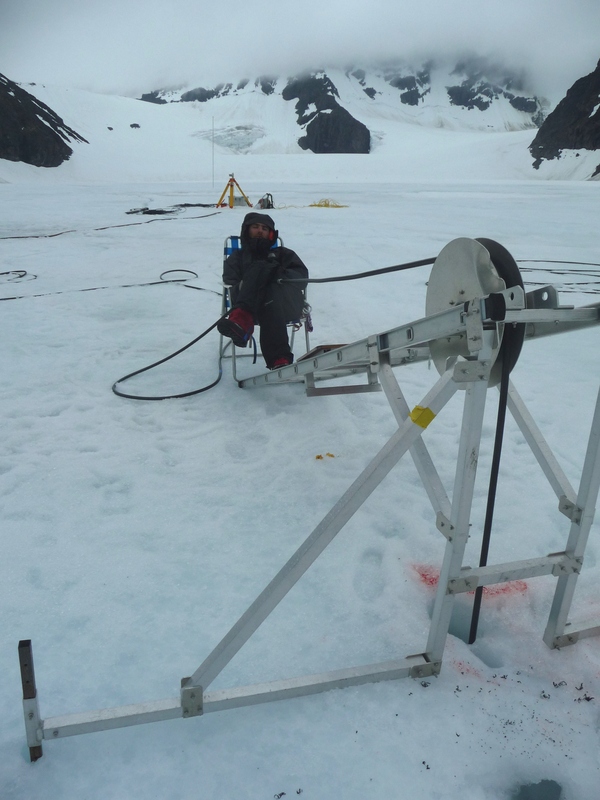 It also means we can still move equipment about on the glacier surface using a sledge. A welcome sight after a long day in the field! The steadily decreasing snow levels were obvious to us yesteday. Aday of steady rainfall has exposed several areas of ice downstream from where we are working. 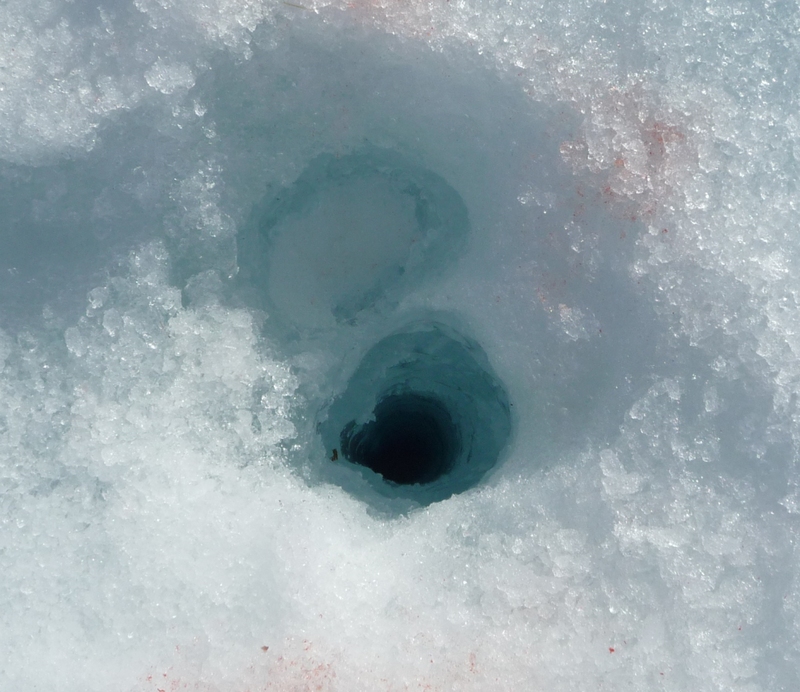 The average snow thickness at the field site is currently around 10-15cm, and a loud sound of running water lead to the discovery of a small (10cm wide) crevasse running across glacier to the west of the first planned borehole location. In addition to the poor visibility that we experienced yesterday, this only emphasised the dangers of working on a glacier and how you must respect these powerful rivers of ice.